Rare Kamakura Ryokai Juyo Token Shinogi zukuri katana and signed Ryokai Naginata Naoshi wakizashi with Tokubetsu Hozon certificate. Ryokai was said to be the son of Rai Kunitoshi and was regarded as one of the great makers of the late Kamakura era. The wakizashi appears to be the big brother of the Akita-Ryokai tanto which is designated as a Juyo-bunkazai and even held the status of kokuho Prior to WW2, after which some blade designations were changed. Both blades are excellent and superb examples of Ryokai workmanship, very well forged blades with an abundance of activity and also showing very nice utsuri .There are many blades by Ryokai designated as Juyo Token, some Tokebetsu Juyo and he also has 5 blades designated Juyo Bunkazai which attest to the quality of his workmanship and the esteem in which he is held as a swordsmith. Both blades have sayagaki by Tanobe Sensei. The blades are both with koshirae. The wakizashi has beautiful koshirae with nicely lacquered multi colour saya. The fuchi kashira are motif of Shachihoko which in Japanese mythology are believed to protect from fire and are often seen on Japanese castle rooftops. The shachihoko are set in a very fine nanako ground with raised waves and are made from shakudo and gold. The menuki are dragons,the tsuba is signed Kunishige and has a deeply very well carved katakiribori motif of dragon,the tsuka has black lacqured same and black silk tsukaito. The koshirae of the katana displays an excellent fuchi kashira in the motif of Karajishi and Botan / lion or foo dogs and peony blossom and branch which are belived to be protectors in Chinese and Japanese mythology and are often seen on the gates of temples to ward off evil spirits. They also symbolise prosperity, success and guardianship.The lion dogs are set in a very fine nanako ground with gold highlights.The menuki are also in the form of lion dogs and the tsuka has white same and a blue silk tsukaito. The signed tsuba is iron with mixed metal butterfly motif and a very well carved raised peony blossom and buds with gold highlights.The saya is a black lacquer and is fitted with tsunagi. According to the result of the shinsa committee of our society we judge this work as authentic and rank it as juyo-token. Ryokai from Yamashiro province was a smith from the Rai School and according to a theory the son of Rai Kunitoshi . Extant date signatures of Ryokai go back to the eras Shoo ( 1288-1293), Einin (1293-1299), Kagen ( 1303-1306), and Enkyo (1308-1311), which would rather make him more a contemporary rather than a son of Rai Kunitoshi. If you follow the two-generations theory of Niji-Kunitoshi and Rai Kunitoshi being two different smiths, the dated specimen would make him the son of Niji-Kunitoshi. It is generally accepted that the workmanship of Ryokai is mostly very close to that of Rai Kunitoshi but with the difference that his jigane is mixed with some masame, that it somewhat tends to shirake, and that his suguha has a more subdued nioiguchi. This blade has a normal mihaba with a harmonious kasane, a high shinogi, a sori that tends to be a toriizori, and shows a dense kitae with a prominent nie-utsuri that is partially mixed with nagare and that is with its jifu-utsuri more on the soft side. The hamon is an elegant suguha in ko-nie-deki that is mixed with Kyo-saka-ashi, fine hataraki along its habuchi, and that is partially subdued (urumi) where an attribution to Ryokai is the most appropriate. A very graceful work of refined but sober taste. Akita Ryokai tanto for reference please note the similarity to the listed wakizashi. According to tradition, Ryokai was a very early son of grand master Rai Kunitoshi, born when Kunitoshi was only 17 years old. He entered priesthood at an early age of 16, taking the very name Ryokai, but returned later to secular life to forge swords, allegedly not only with his father but also learning from Ayanokoji Sadatoshi . As always, there are several traditions and theories going round. One says that he was actually a Nara smith who came to Kyoto to study with Kunitoshi. Another one suggests that he started a normal career as a swordsmith and entered priesthood only later in life, whilst sources who follow the approach that Niji Kunitoshi and Rai Kunitoshi were different smiths say that Ryokai was the son of the former and thus the brother of Rai Kunitoshi. Well, when we take a look at the extant date signatures of Ryokai, which start from Shoo three ( 1290), followed by date signatures from Einin ( 1293-1299) and Kagen ( 1303-1306) to Enkyo two ( 1309) as the latest, we learn that he was active at about the same time when Kunitoshi signed in sanji-mei. We know that Kunitoshi was born in 1240. So when we follow the tradition that Ryokai was born when Kunitoshi was 17 years old, we arrive at Kogen two ( 1256) as year of birth for Ryokai (or at Shoka one  if we follow the Western way of counting years). This date (Kogen two) is also forwarded by the Koto Meizukushi Taizen by the way, what means that not all of its data is far-fetched. This in turn means that he was 34 when he made the earliest extant dated blade from Shoo three (1290) what sounds very plausible. The Koto Meizukushi Taizen also says that Ryokai died in Shokyo four at the age of 72 but the Shokyo era (…¶, 1332-1334) only lasted for two years, and apart from that, if you count 72 from Kogen two (1256), you arrive at 1328 (or 1327 according to the Japanese way), what in turn would correspond to Karyaku three. Taking into consideration that Ryokai's known date signatures end noticeably before those of Kunitoshi (of whom we know date signature up to 1321), I tend to think that he might have died before his father and indeed in the Karyaku era ( 1326-1329). Or in other words, the Koto Meizukushi Taizen might be right about his age at death but not about the year he died in. Before we come to the workmanship of Ryokai, I want to elaborate on his standing in the sword world, or on his ranking if you want. There are 5 blades of him that made it juyo-bunkazai (3 tachi, 1 tanto), no kokuho, about 90 juyo, and 2 that passed tokubetsu-juyo. In comparison, Rai Kunitoshi has 4 kokuho, 17 juyo-bunkazai, more than 200 juyo, and about 30 tokubetsu-juyo. But we have to bear in mind that (due to the fact that Kunitoshi was the grand master of a bustling workshop) there are in total more blades of Rai Kunitoshi extant than of Ryokai, so these numbers are relative. An interesting aspect of Ryokai's ranking is gained by looking into contemporary records. For example, the Chushin Mono , a report on sharp swords from the entire country compiled on request of the bakufu in Showa two (1313) which contains the name of 60 smiths, does list Ryokai but not his father Rai Kunitoshi. Well, the emphasis of such early works remains to be seen as for example, the Chushin Mono lists for Yamashiro also Sanjo Kokaji Munechika, Awataguchi Kuniyoshi, Awataguchi Hisakuni, Ayanokoji Sadatoshi, and kiku-gyosaku, and therefore I tend to interpret sources like that as mere guidelines for what kind of swords are appropriate� to be owned by (and presented to) the contemporary high-society rather than referring to their effective sharpness. But just due to the fact of being on this list, you can get an idea of how high Ryokai's blades were regarded these days. Now to the workmanship of Ryokai. In general, it can be said that the sugata and jiba of his works, and that means both tachi and tanto, are pretty close to Rai Kunitoshi. However, many of his tachi are more on the slender side, showing a noticeable taper, a deep sori, and a smallish kissaki, and it is assumed that it is this trend towards a more classical elegance might be the reason for why some assumed he studied with Ayanokoji Sadatoshi. But at Sadatoshi's slender tachi, the koshizori is more pronounced and straightens more out towards the tip. Apart from that, some of Ryokai’s tachi show a somewhat higher shinogi (and partially also a higher iori-mune) what in turn might have been the reason for assuming a Yamato origin. This is further substantiated by the fact that Ryokai's jigane is basically the Rai-typical ko-itame but which tends to a certain extent to nagare and might even show masame here and there. In addition, we usually see shirake or a shirake-utsuri on his blades and not the nie-utsuri from Rai main line. Also his hamon is a hint more narrow and subdued and has a lesser emphasis on nie than that of Rai Kunitoshi. So we have here again the junction where you were following the Rai Kunitoshi road but then come across nagare-masame and shirake and have to fork to one of the Rai sidelines like Ryokai or Enju. And then the hamon and boshi should tell you, in the ideal case, if you took the right exit. But of course, sometimes it can be very had to tell if a blade is a Rai Kunitoshi, an early Rai Kunimitsu, or a Ryokai. One of his most representative works is the signed tachi that is preserved in the Tokyo National Museum but which does not hold any status (see picture 1). It is ubu and in this case, the soritends more to koshizori, also running into a pretty curved kijimomo-style nakago. We see funbari and a ko-kissaki and the kitae is a dense ko-itame that features masame, shirake, and some jifu. The hamon is a suguha in ko-nie-deki that is mixed with ko-midare, ko-choji, and ko-ashi and the nioiguchi is rather subdued. The boshi is a midare-komi with a ko-maru-kaeri. Also very representative is the juyo tachi that is shown in picture 2. It is ubu too and preserves like the previous blade its long nagasa of 80.3 cm. It tapers, shows funbari and its jigane is an itame that is mixed with masame-nagare and that shows ji-nie and shirake. The hamon is a chu-suguha in ko-nie-deki which tends a little to shallow notare and that is mixed with ko-midare, yo, some kinsuji, and many ko-ashi. The nioiguchi is rather tight and subdued and the boshi is a slightly undulating sugu with a ko-maru-kaeri whereas the ura side features hakikake. Thus with the rather wide ha with its abundance of hataraki and the quality of the jiba place this work pretty close to Rai Kunitoshi. By the way, this blade was one of those that were submitted to (and passed) the very first juyo-shinsa in 1958. It was once a heirloom of the Hisamatsu-Matsudaira family, the daimyo of the Iyo-Matsuyama fief. Another signed tachi of Ryokai that is almost ubu is shown in picture 3. The blade was shortened to 71.0 cm but keeps its rather deep sori (which tends again somewhat to koshizori). We still see a hint of funbari, a noticeable taper, and a ko-kissaki. The jigane is an itame with a conspicuous amount of masame and features ji-nie and a shirake-utsuri. The hamon is a gentle suguha in ko-nie-deki with a little shallow notare and is mixed with ko-gunome and some faint nijuba in places. The boshi is sugu to notare-komi with a ko-maru-kaeri. The tachi in picture 4 is one of Ryokai's highly classical, calm, and unobtrusive interpretations. It is ubu and signed, slender, has a rather deep koshizori, tapers noticeably, shows funbari, a high shinogi, and a ko-kissaki. The kitae is a densely forged but also somewhat standing-out ko-itame that is mixed with nagare-masame, some o-hada, and jifu. In addition, ji-nie and a shirake-utsuri appear. The hamon is a suguha in ko-nie-deki that is mixed with a little ko-gunome, ko-midare, ko-ashi, yo, and some fine kinsuji and sunagashi. The nioiguchi and the entire ha are more subdued. The boshi is a narrow sugu with a brief ko-maru-kaeri. On the omote side we see a suken at the base and there are several tachi of Ryokai known that bear such a short suken or koshibi at the base. Now we come to his tanto, the most famous of course the meibutsu Akita-Ryokai which is designated as a juyo-bunkazai (and was even holding the status of kokuho for a while, i.e. until many designations were reassessed by the Agency for Cultural Affairs after WWII). The name of the meibutsu goes back to the fact that it was once work by Akita Sanesue ( 1576-1660) who held the title of Akita Jonosuke . Later it became an heirloom of the Kaga Maeda family. There are several tanto extant by Ryokai which are interpreted in kanmuri-otoshi-zukuri. The jigane is an itame that is mixed with masame and that shows ji-nieand some shirake-utsuri. The hamon is a suguha in ko-nie-deki with a tight nioiguchi and nijuba and the boshi is rather pointed and features a rather wide and long running-back kaeri, also with nijuba. An outstanding tant by him can be seen in picture 6. It is tokubetsu-juyo and is with the moderate dimensions, the uchizori, and the curved furisode-nakago quite classical. The jigane is a dense ko-itame with fine ji-nie and a shirake-utsuri and the hamon is a chu-suguha in ko-nie-deki with some ko-ashi, yo, and nijuba in places that features a tight nioiguchi. The boshi is sugu with a rather wide ko-maru-kaeri. On the omote side we see a suken with on top of it a bonji and on the ura side gomabashi, both running with kaki-nagashi into the tang. The tang is ubu by the way, so the second mekugi-ana and the kaki-nagashi of the horimono do not speak for a suriage in this case. There is no nagare-masame or weakness in the jigane and so this tanto comes pretty close to Rai Kunitoshi. As it will be addressed in the next chapter, the Ryokai lineage also made some naginata and a shortened one, a naginata-naoshi wakizashi, can be seen in picture 7. It is relative wide and bears on both sides a central shinogi-hi, i.e. a groove that runs along the shinogi. The jigane is a dense ko-itame with some nagare and ji-nie and the hamon is a hoso-suguha in ko-nie-deki that is mixed with ko-gunome, kinsuji, and sunagashi. The boshi runs out as yakitsume and taking into consideration the overall course of the ha, we learn that this was once a shizuka style naginata(more on that interpretation here). But Ryokai also made some more uncommon blade shapes, like for example the one in shobu-zukuri seen in picture 8. Well, the blade has a nagasa of 68.2 cm and is classified, due to the position of the mei, as tachi but it might well be one of these longer uchigatana that come mostly in hira-zukuri that were made by some of the great Kamakura masters for a higher ranking clientele (like the Nakigitsune-Kuniyoshi, see here). The blade has a relative deep sori and shows a dense itame that is mixed with nagare in places and with o-hada along the upper half of the omote side. In addition, ji-nie and a shirake-utsuri appear. The hamon is a suguha in ko-nie-dei that is mixed with some ko-ashi and fine sunagashi and kinsuji and that shows some ko-gunomealong the monouchi. The boshi is formed out of these ko-gunome elements and runs back with a short ko-maru-kaeri and some hakikake. Now I want to talk about some of the Rai smiths who worked under master Kunitoshi and then deal in separate chapters with the Nakajima-Rai lineage, Ryokai, and the Nobukuni School that goes back to the Rai offshoot that was established by Ryokai. Due to the relative large number of active Rai smiths, all these chapters will be divided into several parts. Again, I want to create a useful reference and don’t want to rush through all the schools just because we are running out of time, and there are anyway no limitations of space here in the net. Or in other words, I want that later on, one can find also some of the more unknown smiths being dealt with and their workmanship described in this series. But let's continue with the Rai School. Now when we take a look at the traditional genealogies of the Rai school, we learn that Kunitoshi had supposedly several sons, namely in chronological order: Ryokai , Kunimitsu , Kunizane , Tomokuni, and Kunitoshi , whilst some also see Kuniyasu as his son but more on him in the corresponding chapter. Now Ryokai is said to have been born when Kunitoshi was 17 years old, what would mean in Shoka one (1257). He entered priesthood (more on this in the corresponding chapter) so his second son, Kunimitsu (born in Bun'ei one, 1264) became his heir. His third son Kunizane was born in Bun’ei five ( 1268), his fourth son Tomokuni in Bun'ei nine (1272), and his fifth son Kunitoshi in Kenji two ( 1275). Again, all these dates go back to the Koto Meizukushi Taizen, which is questionable in this context, but I nevertheless want to use the dates here for the sake of comparison. Kunimitsu has been dealt with and Ryokai will get a chapter on his own so let's continue with Kunizane. So his father (and master) Kunitoshi was 28 years old when he was born and according to the Koto Meizukushi Taizen, Kunizane died in Bunpo two ( 1318). The meikan traditionally date him around Showa (1312-1317) and some say active before Kenmu ( 1334-1336),what would both match with the aforementioned life data of 1268-1318. Problem with this date is that quite a number of his works, or at least works that are attributed to him as signed blades are very rare, speak clearly for Nanbokucho, i.e. to a noticeably later production time. Thus it has been forwarded that he lived much longer than said or that there was a second generation Kunizane. A later Rai Kunizane appears in the meikan who is dated around Bunna (1352-1356) what would match (also because he is listed as grandson of Kunitoshi). But there are also some few more classical blades extant, i.e. such which do come close to Kunitoshi if you want, or in other words, we know some few more Kamakura-Rai and several Nanbokucho-Rai works of Kunizane and so both could be true, that he was a master who lived long and who changed his style of the years, becoming also more productive in his later years, or that there were just two generations. If you ask me, I tend towards the latter approach. Anyway, signed works are very rare as mentioned and as far as I know, they count less than a handful, or to be precise, we are talking about 1 tachi, 2 hira-zukuri ko-wakizashi, and 1 tanto. And whilst we are talking about figures, there are no blades of Kunizane that are designated as a kokuhoor a juyo-bunkazai and 18 of him passed juyo(no tokubetsu-juyo) to this day. Unfortunately, I don't have a picture of the tachi, which seems to be, with a (only very slightly shortened) nagasa of 61.1 cm, more a kodachi than a real tachi. It is preserved in the Ise Shrine's Jingu Chokokan Museum. Sato Kanzan describes it as having a normal mihaba with a thin kasane and a ko-kissaki and showing an itame that is a little tired, stands out, and shows some masame and fine ji-nie. The hamon starts in the lower half as ko-midare mixed with tobiyaki and develops in the upper half to a hitatsura, running into a midare-komi boshi with a ko-maru-kaeri with hakikake. There is a bohi on both sides that runs with kaki-nagashi into the tang and the blade bears a finely chiseled tachi-mei. So with the thin kasane and the hitatsura, it looks like we are facing here a later, i.e. a Nanbokucho work. Picture 1 shows one of the two extant signed hira-zukuri ko-wakizashi. It has a nagasa of 38.4 cm and does show a sori, namely one of 0.3 cm. And with the thin kasane, we have here really a blade whose sugata says Nanbokucho, and not early but hey day Nanbokucho. The kitae is a very dense ko-itame with ji-nie and the hamon is a gunome-midare in ko-nie-deki that is mixed with ko-notare, ashi, yo, and sunagashi and that tends, like the above mentioned tachi/kodachi, in the upper blade section to hitatsura. The boshi is midare-komi with hakikake and shows a long and wide kaeri that runs as midare-komi back to form a part of the hitatsura approach. On the omoteside we see a suken as relief in a katana-hi and on the ura side a futasuji-ji. The tang is ubu, has akurijiri, kiri-yasurime, and shows centrally a rather finely chiseled sanji-mei. Ryokai was succeeded by his son Hisanobu who is - due to the fact that he often signed just with the prefix ”Ryo” mostly referred to as Ryo Hisanobu . The Koto Meizukushi Taizen says that he was born in Kagen one ( 1303) and died in Oan seven ( 1374) at the age of 73. Again, we have here dates which don't add up and apart from that, the source also mixes up Hisanobu with Nobuhisa . That is, it lists Nobuhisa as son of Ryokai and Hisanobu as his successor whereas all other sources state it the other way round, i.e. Nobuhisa being the son of Hisanobu. Hisanobu being the son of Ryokai is also proven by dated and signed works which will be addressed in the following. First, there is a pretty famous tachi extant (see picture 1) which is signed kakikudashi-style Ryokai Kagen sannen sangatsu hi , Ryokai, on a day of the third month Kagen three �) on the haki-omote, and Yamashiro no Kuni-junin Kuroza (rest cut off) on the haki-ura side. This mei was for a long time interpreted as showing Ryokai’ first name, being Kurozaemon or Kurozaemon no Jo but in more recent years another tachi has been found (see picture 2) which is signed Kurozaemon no Jo Hisanobu saku Kagen ninen uzuki hi, on a day of the fourth month Kagen two . So Kurozaemon no Jo was obviously the first name of his son Hisanobu and not of master Ryokai and the Kagen three tachi is thus obviously a gassaku. Incidentally, the Kagen two tachi by Hisanobu bears somewhat apart from the actual mei and interpreted in a completely different way the name Ikkai. Some speculate that this was the nyudo-go of Hisanobu but the NBTHK says that it is a kiritsuke-mei, i.e. added later. Well, and final proof for Hisanobu being the one of Ryokai delivers a naginata (see picture 3) which is signed Ryokai shisoku Hisanobu “ Tokuji sannen tsuchinoe-saru jugatsu muika, Hisanobu, son of Ryokai, on the sixth day of the tenth month Tokuji three , year of the monkey. Now let me introduce all these blades, beginning with the gassaku which is designated as a juyo-bunkazai, owned by the Atsuta-jingu, but preserved in the Tokyo National Museum. It must have had a magnificently long nagasa because it measures 82.6 cm in its shortened condition. It has a deep sori that tends to koshizori, maintains a little funbari, tapers noticeably, and ends in a ko-kissaki. The jigane is a ko-itame that is mixed with masame-nagare and fine ji-nie as well as a shirake-utsuri appear. The hamon is an overall rather subdued suguha to hoso-suguha in ko-nie-deki that is mixed with ko-midare, some ko-choji, ko-ashi, and that features a rather tight nioiguchi, and the boshi is a thin sugu to midare-komi with a ko-maru-kaeri. The Hisanobu tachi with the Ikkai supplement is shown in picture 2. This blade too is with a nagasa of 84.0 cm pretty long. It has a wide mihaba that tapers noticeably, a deep koshizori with funbari, and end in a ko-kissaki. The jigane is a ko-itame that is mixed with a conspicuous amount of masame and features fine ji-nie and a shirake-utsuri. The hamon is a suguha-cho in ko-nie-dekithat is mixed with some ko-gunome, ko-midare, ko-choji and ko-ashi and has a subdued nioiguchi. The boshi is sugu with a ko-maru-kaeri and tends to a little bit to a sansaku-boshi. The omote side bears a bonji with below a suken, and the ura side a bonji with below gomabashi, both of them running as kaki-nagashi into the tang. Picture 3: The naginata which explicitly states that Hisanobu was the son of Ryokai. It is owned by the Tokugawa Museum, has a nagasa of 42.8 cm, and is interpreted in the typical Ryokai style. An interesting blade is shown in picture 5 (click on the pic to get to the website), interesting insofar as that it is very similar to the shobu-zukuri tachi of Ryokai shown in picture 8 of the previous chapter. Hisanobu's blade is ubu but unsigned, has a nagasa of 67.3 cm, a high shinogi, and shows a ko-itame that is mixed with much nagare-masame and some o-hada in places, even formingsome mokume swirls here and there. This time a faint nie-utsuri appears and the hamon is a subdued hoso-suguha with ko-ashi, and the boshi is sugu too and runs out as yakitsume. Now let's talk about Hisanobu's tanto. An often quoted work is the tanto shown in picture 6 that is dated Enkyo three ( 1310). It is a so to speak standard hira-zukuri tanto for that time, showing moderate to smallish dimensions, an uchizori, and a jigane in dense ko-itame that tends to nagare along the mune and that displays a midare-utsuri. This midare-utsuri is in my opinion linked to the interpretation in midareba. I mean, we see a ko-notare-based ko-gunome in nioi-deki that is mixed with ashi and that features a mizukage, thus quite a flamboyant interpretation for the Ryokai group. The boshi is midare-komi too and runs back in a ko-maru-kaeri. So when we bear in mind that the latest known date signature of Rokai is from the previous year and take into consideration that not that many works of Hisanobu are extant, we can speculate that he might have mostly worked for his father. This is also supported by the fact that we are facing a pretty inconsistent signature style of the characters for Ryokai, I am hinting at daisaku-daimei, and this might go hand in hand with the tradition that Hisanobu signed himself with Ryokai one or two years after his father had died, so at least according to the Goto Tebiki Sho . Well this work was published in the Kan´ei era (1624-1644), more than 300 years after Hisanobu's active period. Incidentally, the known date signatures of Ryo Hisanobu, which are pretty rare, span just from Kagen (1303-1306) to Enkyo ( 1308-1311). 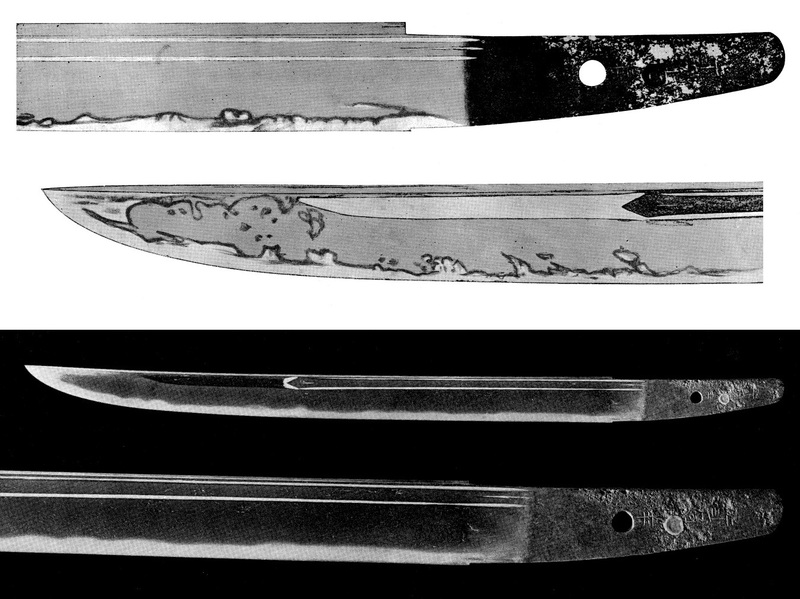 But the majority of Hisanobu's tanto is in suguha, like for example the blade shown in picture 7. It is with a nagasa of 26.2 cm of standard length has no sori. The motohaba is with 2.42 not really on the narrow side for a tanto but when you take a look at the width of the tang, the condition of the ha-machi, and the thinness of the ha, I think that this blade has lost some substance. It shows a finely forged ko-itame that is mixed with ko-mokume and nagare and features ji-nie, a shirake-utsuri, and even a few chikei. The hamon is a hoso-sugha in ko-nie-deki that is mixed with sunagashi and fine kinsuji and the boshi is sugu with a ko-maru-kaeri. Now Ryo Hisanobu was succeeded by his son Nobuhisa who lived, according to the Koto Meizukushi Taizen, from Bunna one ( 1352) to Oei 26 ( 1419). He signed in the syntax of his father, i.e. with Ryo Nobuhisa� and worked allegedly also in the same style, although I have never come across any of his works. Well, Tsuneishi goes pretty much into detail but the problem is, he just addresses a 3rd generation Ryokai� and does not say if he means Nobuhisa or not. Apart from that, most other sources don't count an exact succession of generations of the Ryokai lineage or just say that Ryokai was the 1st generation and Ryo Hisanobu the 2nd, period. Tsuneishi introduces even more generations, i.e. a 4th generation who was active around Joji ( 1362-1368) and a 5th generation who was active around Oei ( 1394-1428). For a better overview, I have compiled a genealogy of the Ryokai School that is provided above. So Tsuneishi describes the 3rd generation as working basically in the style of his father and grandfather, hardening a hoso-suguha but which shows less nie and that comes close the a pure nioi-deki. He further states that his nioiguchi is not tight and dull (he uses dim, blurred), that most extant works show a tired yakiba, a weak and roughish hada, much masame towards the mune, and a shirake-utsuri. His tanto are smaller dimensioned and show a hoso-suguha that is mixed with ko-gunome-midare which is more busy than the ha of the 1st and 2nd generation. And he concludes that the 3rd generation also does not match the quality of his two predecessors. Anyway, the old-established Yamashiro schools were all fading by the end of the Nanbokucho period. The Awataguchi School had long been gone. The Rai School had just disappeared or had scattered to the four winds (Nakajima, Echizen, Higo) and its remaining smiths were outshined by masters, for example from the Hasebe and the Nobukuni School, who adjusted their work very much to the new Soshu tradition. The Ryokai School shared the same fate. Their own offspring Nobukuni overshadowed all other Ryokai students and the son of Hisanobu's student Yoshisada , i.e. the 2nd generation Yoshisada, moved eventually down to Kyushu where he became the ancestor of the so-called Tsukushi-Ryokai group. conservative "Three-characters" RAI KUNITOSHI SUGUHA. defined KO-NIE HOSO-SUGUHA from which ASHI are seen. KO-GUNOME or CHOJI patterns push from within MIDARE BA. Shinogi-tsukuri, Ihori-mune with strong and Koshizori and stout Chu-Kissaki. Ko-Itame mixes with Masame Hada, Shirake drifts over. Hoso-Sugu line has Ko-Midare Ko-Choji within. Ko-Ashi define in a mostly tight Nioi-guchi. Ko-Midare that approaches the Ha closely. Ko-Itame Hada has Masame with Ji-Nie. Tight Nioi-Guchi Chu-Suguha becomes Nijuba with Ko-Nie. Ubu Haagari Nakago has two mekugi-ana. According to the result of the shinsa committee of our society, we judge this work as authentic and rank it as Tokubetsu - Hozon Tōken .